This mosaic was inspired by the Carina Nebula, the birth of stars, and all of the knowns and unknowns of space. The swirling gas, the light, the shapes... it seems that a person could endlessly be inspired by the images NASA has made available to all of us. This mosaic was a finalist piece in an art contest held by NASA. There were over 600 entries for the contest... so being a finalist was a huge honor. 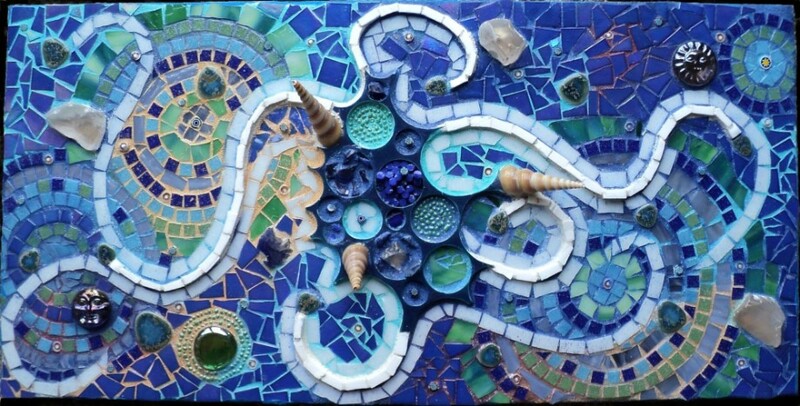 There are many components (to be more true to Carina, I wanted to use many different elements to create the whole): marble, sea glass, beads, sand, stained glass, shells, tile, blown glass shapes, millefiori, and all grout has been hand painted as well.